Better sound in the palm of your hand Enjoy your music on the go everywhere you go. The SoundLink(r) Mini Bluetooth speaker II delivers full natural sound with dramatically deeper bass than you'd expect from an ultra-compact speaker that fits in the palm of your hand. It connects wirelessly to your smartphone tablet or other Bluetooth device so you can listen to your music videos or games anytime anywhere. And the built-in speakerphone lets you take calls out loud too. Big sound�with deep bass�for a full-range listening experience Wireless and ultra-compact so you can take Bose(r) sound anywhere Built-in speakerphone lets you take calls out loud Voice prompts talk you through Bluetooth pairing so it's super easy Rechargeable battery plays up to 10 hours See how you can enjoy grab-and-go sound » Plays where you play The SoundLink(r) Mini speaker II is small and light enough to tuck into your bag. It weighs in at just 1.5 pounds. Its low profile lets you place it almost anywhere and provides a low center of gravity that makes it nearly impossible to tip over. The rechargeable lithium-ion battery delivers up to 10 hours of playtime and charges with most USB power sources. At home you can listen indefinitely by keeping the unit on the charging cradle. The battery charges as you listen and the speaker is always ready to grab and go. Bluetooth connectivity SoundLink(r) Mini II has a range of about 30 feet so you can enjoy the sound you want without wires. Voice prompts talk you through pairing with your smartphone iPad(r) or other Bluetooth device making it easier than ever. And the speaker remembers the most recent six devices you've used so reconnecting is even simpler. Big performance small size You might not expect sound this rich from a speaker this small but the SoundLink(r) Mini speaker II is something new. You don't have to sacrifice performance for portability. Proprietary technologies and an innovative driver configuration combine to deliver full-range sound�including deep lows�in an ultra-compact package. It lets you take your music to places it's never been before. 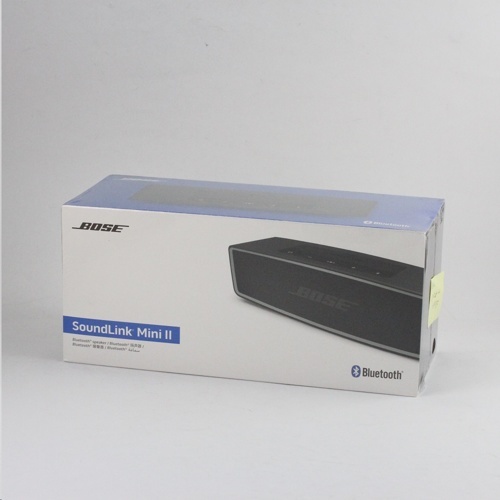 Easy operation elegant design The SoundLink(r) Mini speaker II is designed for sleek simplicity. Its single-piece aluminum casing is both attractive and durable. The speaker features power and volume buttons�you control all other functions from your Bluetooth device. More features Charging cradle recharges the battery serves as a convenient home base for your speaker and it lets you play while it charges Wall charger can be plugged into the cradle or directly into the speaker Auxiliary port lets you connect other audio sources like an MP3 player USB port allows for software updates to ensure ongoing Bluetooth device compatibility Colorful protective covers Additional soft covers allow you to customize the appearance of your speaker while providing added protection for the aluminum body from scratches or abrasions. Available in an assortment of colors.